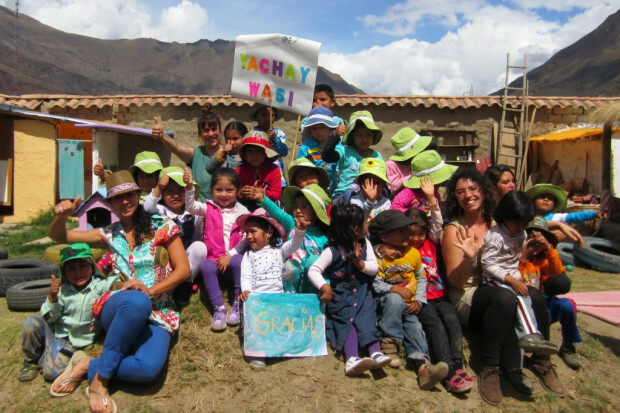 2015 was another successful year at Yachay Wasi!!! The year came to the end and we want to thank every and each person who has been part of this great year. It was tough, we had to work very hard during the hole year, but we can say now that it was worthy. The Yachay Wasi children had a very happy year full of games, joyness, learning, songs and friends. We all feel very grateful and rewarded for all we could achieve toghether. To celebrate this we organized a big party. Some mothers cooked a "chocolatada" (hot chocolate) with paneton, there was a clown show, presents for the children and more surprises. Children participated in a play in which they danced representing a story that they loved to listen to during the year. They worked hard with the teachers making their costumes and decorations the past weeks and it all looked amazing. Families, children and teachers had a wonderful time toghether. We are glad to bring hapiness and joy to these great people, who rarely have the oportunity to live moments like this one. We want the following year to be better than this one. Our goal is to open a new classroom for the littlest ones. There are a lot of families, most of them single mothers, who are asking for attention to their 1 and a half and 2 year olds sons and daughters. We would love to help this women, but we need your help to make this happen and to make 2016 another happy year for our students. If you want to help us, please go to https://www.indiegogo.com/projects/yachay-wasi-education-through-love#/story or you can donate to our bank account in Peru. Thank you very much for being part of this family and this success!!! We wish you a great, peaceful and loving 2016!!! Guillermina and all the Yachay Wasi family.